The other day, I prayed that the Lord would help me understand the depth of my sin. I know I’m a sinner, but that knowledge didn’t have the impact I felt it should. So I asked the Lord for help. And he came through. It’s kinda like praying for patience; the only way to grow patience skills is to practice…which means we have to face situations that test our limits. Hard. Asking the Lord to impact me with the depth of my sin meant an overwhelming sense of guilt. The guilt felt heavy, tangible. Events from the days and weeks prior raced through my mind. “Oh, I should have handled that differently. Why do I think like that? I hate that I deal with ______ like that. I should have outgrown that by now!” These words and more were all I could think of. So I started telling the Lord. Told him all these terrible things I’d done and asked him to help me get it together. Here’s what I think. We need to feel and know the weight and guilt of our sin. The end of Romans 3 talks about righteousness through faith. It says, “This righteousness is given through faith in Jesus Christ to all who believe. There is no difference between Jew and Gentile, for all have sinned and fall short of the glory of God” (Romans 3:22,23). Ouch. See, laying down the burden – giving it to God – allows us to live in the knowledge that we are sinners, while understanding that we are forgiven! That is where the joy and peace comes from. That’s how we can sleep at night. 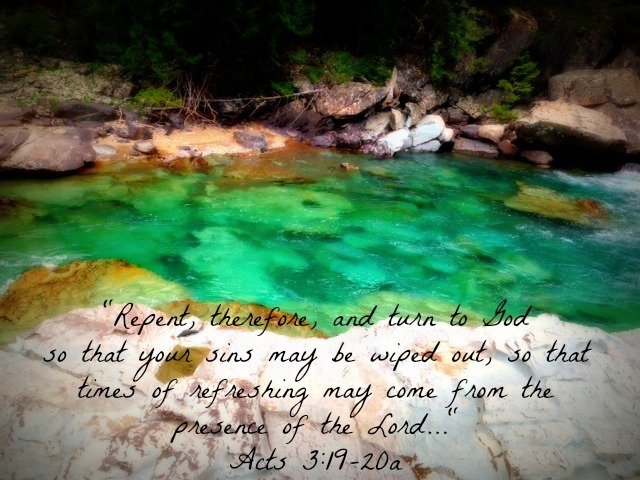 When I gave up all of the things I felt so guilty about – those sins – to the Lord, I felt refreshed. I hope you can find the same refreshing! Posted in Challenge and tagged Bible Study, Forgiveness, Lord, Refreshing, Sinner. Bookmark the permalink.